Courgette and lemon pasta makes a speedy summer meal. Use as many courgettes as you like! The lemon is lovely and refreshing! If you’re feeling fancy, you could make your own pasta but we find that chucking it from a packet into a pan is quick and just as tasty!! Brown rice pasta for the number of people you are cooking for! * To roast the garlic , put a whole garlic bulb into an oven dish, drizzle over a tablespoon of olive oil and a sprig or two of rosemary and thyme . Roast in a hot oven for 20- 30 mins until the garlic is soft and squidgy. Leave to cool before chopping off the top and squeezing out the flesh. 1. Start by dry frying or griddling the courgettes. If you haven’t got a griddle use a large heavy based nonstick frying pan and press down the slices until golden brown with a spatula. Do this in batches and remove to a dish. Add the grated rind of lemon and sprinkle over the juice and some olive oil and season with a little crunchy Seasalt and black pepper. Then mix in the roasted garlic. Leave the courgettes to marinate while you cook the pasta. 2. 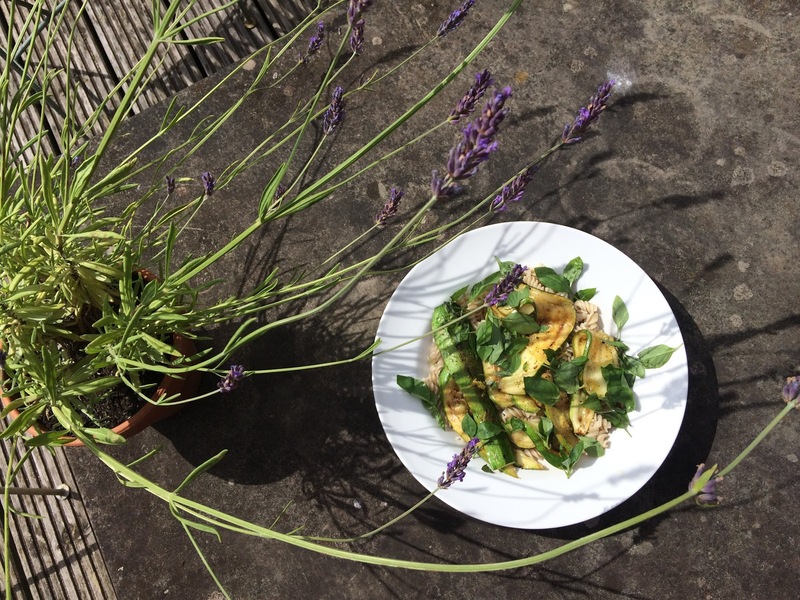 Then simply serve the pasta topped by the courgettes with all their juices and a scattering of basil leaves to finish. Voilà!